The pop music world is famous for short-lived careers with lots of artists and bands who become the grist for trivia contests. There are also plenty of aging performers who continue to play but find their main audiences on nostalgia tours and at events like county fairs, playing their old hits and little else. This week, we have a new recording by an artist who has a remarkable and durable career, and managed to maintain both his reputation and creative output for a very long time: Paul Simon, who has just released one of his most striking and musically intriguing albums, a CD called So Beautiful or So What. Paul Simon has been recording now for some 54 years, having released his first record with his childhood friend Art Garfunkel in 1957 while they still in their teens, under the same Tom and Jerry. Of course, Simon and Garfunkel were a folk-rock phenomenon starting in 1965 with the Wednesday Morning 3 AM album and the subsequent electrification of Simon's song Sounds of Silence. After Simon and Garfunkel split in 1970, Simon has been releasing a series of albums that during the 1970s yielded some major hit songs. In the 1980s, Simon was fearing his creativity was spent. So he found himself listening to some music from South Africa and decided to draw on that influence, and the result was his classic 1986 album Graceland, which not only won a Grammy Award, but helped to popularize the whole world music scene here in the US. Though Simon has had his ups and downs, the latter including the commercial failure of his Broadway musical Capeman, Simon has continued to explore new musical avenues. While hardly the first to take up the world music styles that have marked his recordings in the last quarter century, he managed to use his popularity clout to introduce new audiences to some distinctive styles they might not otherwise hear, and in the process, create some memorable music. For So Beautiful or So What, Simon wove together a curious collection of influences into a surprisingly organic mix -- some more African musicians, a hint of Indian music, and African American Gospel. There are also bluegrass musicians on the CD, though that influence is less pronounced. And there are some samples and loops of including historical recordings that are used as well. But despite the quite interesting and eclectic musical accompaniment, this CD is one of Simon's most lyrically compelling recordings, taking up some rather weighty subjects like philosophy and a consideration of the afterlife, though with Simon's trademark whimsical outlook. And the CD is interesting because of the relatively small groups that appear on each track, with each player adding some distinctive influence. With Simon about to turn 70 later this year, he revisits a theme that has been part of his musical output since the 1960s, a consideration of the passage of various stages of life. With a stream of songs starting with The Leave That Are Green, and including Still Crazy After All These Years, and more recently Old from his You're the One album, Simon continues that more intensively on So Beautiful or So What, considering mortality on a number of its tracks. But as Elvis Costello points out in his liner notes for this CD, the result is uplifting. Among the musical guests are bassist Bakithi Kumalo, who was prominent on the Graceland album 25 years ago, and Cameroonian guitarist Vincent Nguini. Also from the bluegrass world, the members of Doyle Lawson and Quicksilver are brought in to do backing vocals in the Southern Gospel style in spots, along with violinist Gabe Witcher from the Punch Brothers. The CD also has two tracks with samples from historic recordings of African American Gospel groups, and a harmonica solo from a recording by the late bluesman Sonny Terry. Simon has become very adept at incorporating all this diverse influences and on this album, especially, letting them be in the service of the songs, rather than dominating one's attention. 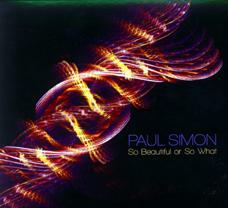 Paul Simon's New CD So Beautiful or So What has already been called his best since Graceland 25 years ago. I would go along with that. His musical curiosity undiminished, Simon again brings together an intriguing mix of styles from very diverse musical traditions, from African to Indian to bluegrass, brought together generally in small groups. I also think it's among his most lyrically deep album. This is a CD that reveals something new each time you listen. Its short 38 minute length does leave one wanting more. Unfortunately where it falls down is in sound quality. We'll extremely charitably give it a C-minus. One would not expect an artist on the level of Simon, and long-time engineer Phil Ramone to go for the murky, hyper-compressed sound typical of a garage band recording on a laptop. But that's what it sounds like, with even the quietest songs cranked up to hitting digital max on almost every beat, sucking out almost all musical dynamics, and giving Simon's vocal a flat, thin sound.It's a discouraging contrast to the wonderful sound of the original version of Simon's Graceland. At an age when most pop performers settle into the oldies circuit or just retire, Paul Simon considers mortality, philosophizes, and shows himself to be a most wise musical sage, who has not given up one iota of his creativity.